Amazon continually updates it's browse node categories for books, to cater to the shifting needs of the market. In the last six months, 563 new categories were added, and 122 were removed. There were also a number of category name refinements. Categories serve the purpose of helping readers find similar books. As the number of books allocated to a category fluctuates, the granularity of the categories needs to change too. If categories remained static, they'd become unbalanced, with too few or too many books, which would make browsing and searching for books a challenge. We've summarized the changes to book categories (browse nodes), that have occurred over the past six months, looking at the impact on various top level categories. There were 345 new 'Teen & Young Adult' categories added in the past six months, which is likely a reflection of the huge increase in YA sales over the past year. Only one 'New Adult' category was added (Science Fiction & Fantasy/Fantasy/New Adult & College), to take the total to two categories (the other is: Romance/New Adult & College). Rather than expand this newer category, the breadth of 'Teen & Young Adult' has been expanded to accommodate the influx of titles in this area. Additions to 'Computers & Technology' were dominated by 'Software' (Adobe, Enterprise Applications and Business) and 'Web Development & Design' (Programming and Web Design) sub-categories. The largest increase to the 'Religion & Spirituality' genre was in the 'Religious Studies' sub-category, comprising 24 of the 52 additions. A full list of new categories is available here. 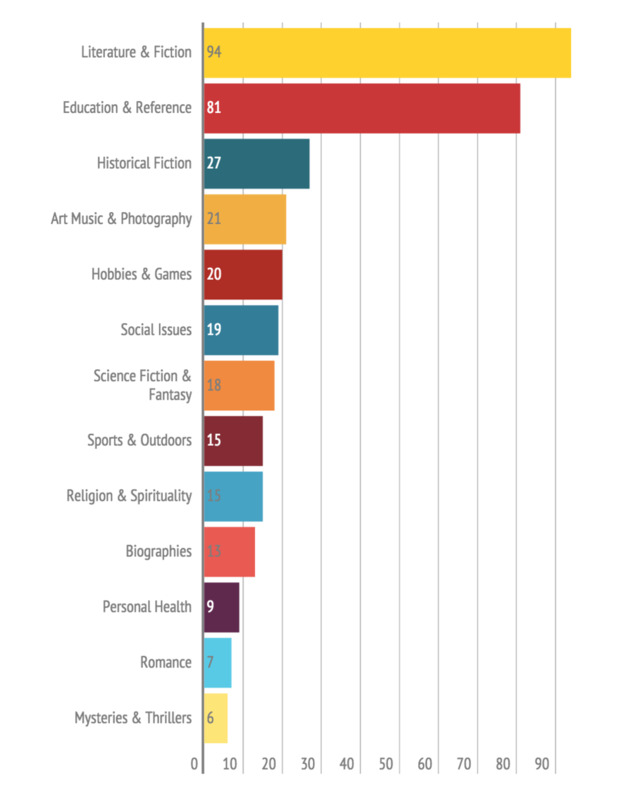 The 'Computers & Technology' genre had the most categories removed (88), but had an almost equal number of categories added (87). Technology experiences rapid changes, so a commensurate shift in categorization of the subject matter is likely to occur. 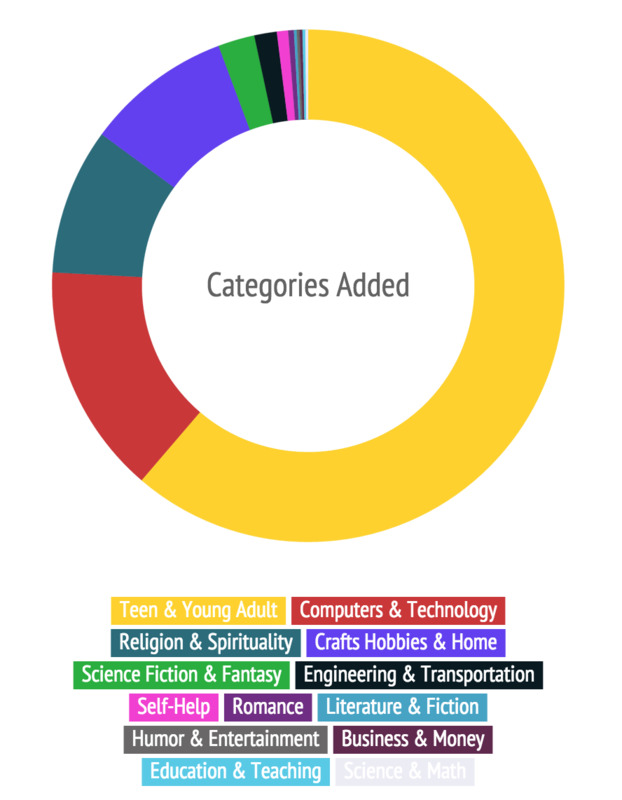 The second largest genre with categories removed was 'Crafts, Hobbies & Home', and within that genre, almost half were in the 'Home Improvement & Design' sub-category. For a full list of the removed categories, click here. Changes in browse node categories reflect shifts in the type of books available for sale. An increase in categories for a genre is likely driven by a combination of additional supply of books in the genre, and of increased effort to improve the searchability of those books. One may speculate how these two factors reflect increased demand for books in a genre.